At its Fall Leadership Academy meeting, the AANA Board of Directors approved an updated version of the Policy on Evidence-based Process for Practice-related Documents. The policy was updated to reflect that draft practice-related documents will be made available to solicit feedback from AANA members for a one-month open comment period. Announcements of available open comment opportunities will appear in the Anesthesia E-ssential, the AANA website, and other communication channels. Member participation and feedback is encouraged in this process. Happy Thanksgiving—See You Two Weeks! Due to the Thanksgiving holiday, Anesthesia E-ssential will not come out on Nov. 22, 2017, and will resume publication with the Nov. 30 issue. The E-ssential staff wishes all of our readers a joyous Thanksgiving and holiday season. Your AANA leadership wants to hear from you. Join CEO Randy Moore, DNP, MBA, CRNA, and President Bruce Weiner, DNP, MSNA, CRNA, on an AANA Connect town hall meeting Thursday, Nov. 30, at 8 p.m. EST/7 p.m. CST in the All Member Community. Read more about these expanded requirements. Each state association may submit one nominee for president-elect, vice president, and treasurer. In addition, state associations may submit one nominee for a director for their region. In 2018, directors from Regions 2, 3, 6, and 7 are eligible for election. Finally, state associations may nominate one member from their region for the AANA Nominating Committee from Regions 2, 3, 6, and 7 to serve a two-year term and one member for the Resolutions Committee. Members are also allowed to self-nominate or nominate another member as long as the nominee meets the qualifications for office found in the AANA Bylaws and Standing Rules. Two sponsored courses that are free to AANA members are set to expire soon: Respiratory Compromise, Moving Patients from Surgery to the PACU, and Perioperative Delirium: The Latest Science in Anesthesia Management. 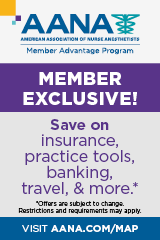 Visit AANA Learn Member Exclusives, and be sure to log in before taking the courses. Both are supported by an educational grant from Medtronic. The Accreditation Association for Ambulatory Healthcare (AAAHC) Institute for Quality Improvement’s Safe Injection Practices Benchmarking Study for January - June 2017 shows that some AAAHC-accredited organizations are having challenges complying with national guidelines on safe injection practices. The study was based on self-reported responses from 110 AAAHC-accredited ambulatory organizations. AAAHC noted that the results are similar to other recent studies indicating that reuse of syringes and absence of hand hygiene before injections remain problematic. Ninety study participants were ambulatory surgery centers or office-based surgery organizations. A key finding for these organizations is that less than 60 percent conducted a safe injections practices (SIP) assessment in the last year. In addition, 84 percent perform at least one of the following hand hygiene techniques before accessing supplies and preparing and administering injections: wash with soap and water, or use antiseptic hand wash, hand rub or surgical hand antisepsis. The Joint Commission’s human factors engineer, Erin Lawler, MS, CPPS, discusses this important patient safety topic in a brief podcast. The podcast accompanies The Joint Commission’s recent release of Quick Safety, Issue 35: Minimizing noise and distractions in the OR and procedural units. Findings from a small study suggest that prolonged exposure to anesthesia increases the risk of brain abnormalities in infants. To eliminate potential confounders like premature birth or heart problems, colleagues from Boston-based Harvard Children's Hospital singled out full-term babies requiring gastrointestinal surgery. Based on MRI readings from nine sedated infants and 12 healthy controls, they observed more evidence of brain atrophy in the children who underwent anesthesia. The proportion of fluid in and around the brain, for instance, was about 4 percent higher in exposed babies—whose brain growth also lagged that of unexposed babies. The researchers also documented a positive association between total number of MRI findings and hours of anesthesia exposure as well as duration of sedation. The good news, according to investigator Dusica Bajic, MD, PhD, is that total brain volume eventually climbed in the infants who underwent surgery, suggesting that brain growth is not permanently stunted after prolonged sedation. Bajic stressed that the results are preliminary, with many unanswered questions. "There's a lot of work to be done with respect to saying that this has to do with sedation, versus surgery on its own," she said. From "Prolonged Sedation May Be Bad for Baby's Brain"
In an effort to identify predictive traits for problematic airways, researchers at the University of Texas Southwestern Medical School conducted a prospective analysis involving 1,351 patients. All were successfully intubated, with a difficulty rate of roughly 4.5 percent, according to assistant anesthesiology professor Tiffany Moon, MD. She and colleagues found that anatomic markers like short and thick neck size, smaller mouth opening, and inability to bite the upper lip with bottom teeth were predictive of difficult airway, as were older age, male gender, and history of obstructive sleep apnea. They also discovered, however, that body mass index (BMI) alone was not a good predictor. "Our analysis showed that even patients with very high BMIs were not more difficult to intubate," Moon reported at the International Anesthesia Research Society 2017 annual meeting, "as long as their other medical and anatomical variables were favorable." She also informed the audience that Intubation Difficulty Scores were comparable no matter if the provider was faculty; a certified registered nurse anesthetist; or a resident, regardless of whether they were in clinical year one, two, or three. From "Anatomic Measurements Can Predict Difficult Airways, But BMI Less Useful Independently"
Contrary to earlier findings, new research results suggest that epidurals using fentanyl do not reduce the odds of successful breastfeeding. Investigators at Northwestern University randomized a sample of expecting women to receive their epidural with just the local anesthetic bupivacaine or with bupivacaine plus 1 or 2 micrograms per milliliter of fentanyl. All 345 participants had previously undergone labor epidural and had successfully breastfed in the past. At six weeks post-delivery, the frequency of breastfeeding was 97 percent for the bupivacaine-only group compared with 98 percent in the lower-dose fentanyl group and 94 percent in the higher-dose fentanyl group. While experts have worried that fentanyl transfer from the mother through the placenta might depress the baby's nervous system, lead investigator Robert McCarthy, PharmD, said the study "appears to show that this does not occur at doses commonly given during labor and delivery." A research professor of anesthesiology at Northwestern's Feinberg School of Medicine, he noted that a neonate's liver is insufficiently developed to process drugs in the same way as an adult liver. From "Early Breastfeeding Success Not Affected by Epidural Pain Relief With Fentanyl"
A study reported in the British Journal of Anesthesia looked at the effect of intraoperative naloxone on hyperalgesia following elective thyroid surgery. Researchers randomized 91 participants to one of three treatment arms: low-dose remifentanil plus placebo, high-dose remifentanil plus placebo, or high-dose remifentanil plus low-dose naloxone. Although the incidence of hyperalgesia one day after surgery was lowest in the low-dose remifentanil group, at 30 percent, the rate for the remifentanil-only group was more than double that of the remifentanil-naloxone group, at 67.7 percent versus 33.3 percent. The finding showed that high-dose remifentanil plus naloxone curtails postoperative hyperalgesia better than high-dose remifentanil by itself; however, there was no meaningful difference between any of the treatment groups at 48 hours in terms of pain intensity, analgesic requirement, or adverse events. From "Intraoperative Naloxone Reduces Remifentanil-Induced Postoperative Hyperalgesia"
With the 2017 annual PAINWeek meeting as the backdrop, industry researchers recently reported on the promise of IV meloxicam as an alternative to opioids following surgery. Phase III study results from Recro Pharma demonstrate that—based on postoperative opioid needs, pace of wound healing, and a low rate of serious adverse events—IV meloxicam is both safe and tolerable after orthopedic, abdominal, gynecologic, and spinal operations. Significantly reduced opioid use with IV meloxicam, meanwhile, was associated with less nausea and vomiting. 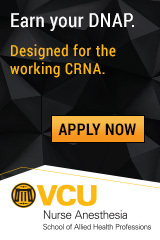 "Because IV meloxicam is in the nonopioid class of drugs, Recro Pharma believes it will overcome many of the issues associated with commonly prescribed opioids, including respiratory depression, constipation, excessive nausea and vomiting, as well as not having addictive potential while maintaining meaningful analgesic effects for relief of pain," said Recro's chief medical officer, Stewart McCallum, MD. From "IV Meloxicam Spares Opioid Use, Reduces Pain From Surgery"
For every 10 healthcare professionals (HCPs) who develop flu-like symptoms, four show up for work despite the threat they pose to patients. The finding is from the Center for Disease Control's annual survey of the nation's HCPs, which most recently fielded responses from more than 1,900 workers during the 2014–15 flu season. Of that number, 414 reported experiencing fever along with cough or sore throat; and about 41% of them worked for a median three days while presenting these symptoms. The trend was more prevalent among doctors, pharmacists, and other clinical professional HCPs but less common among nurse practitioners, physician assistants, and nonclinical HCPs. Poll-takers justified going to work while ill because they felt well enough to perform their duties, did not believe they were contagious, or did not want to create a burden for colleagues, among other reasons. "Patients' health and wellbeing are at stake when contagious HCPs opt not to stay home," remarked Linda Greene, RN, president of the Association for Professionals in Infection Control and Epidemiology (APIC). "Tailored strategies per occupation and health institution, including updating paid sick leave policies, can empower HCPs to make healthy choices not only for themselves, but for coworkers and patients." The survey results are reported in APIC's American Journal of Infection Control. From "4 in 10 Healthcare Professionals Work While Sick"